Not sure if a Spiritual and Wellness event is for you? Guess what? It is for everyone. I used to get a little intimidated by these types of events, feeling unsure if I was "spiritual" enough to attend and/or even more to participate. What I know now, is Spirituality and Wellness is about the journey of self-improvement, and no matter where you are on that journey, there is always room for inspiration. And no previous experience is needed, just an open mind. I think of Spirituality as that feeling…maybe for you it is like a strong pull or maybe it’s a slight nudge drawing you towards finding ways of incorporating a greater sense of well-being, health, and happiness in your day-to-day life. I call this feeling spirituality, you may think of it also as mindfulness. I believe both terms encompass a vastness of beliefs, tips, tools, ideas, vibes that can be both physical and mental that inspire positive change, sometimes small and other times life transforming. As Gabby Bernstein says in her talks, big changes can come into your life just from “cleaning up your thoughts.” I love and believe this wholeheartedly. Part of my own spiritual journey has been to realize that when we are open-minded to trusting and believing that we will be guided to amazing opportunities for spiritual growth, it happens. I believe being connected with this special event is one of those BIG “hello..if you didn’t believe in it before, you will have to now, here is your opportunity” example of this in my own life. Thank you Universe!! 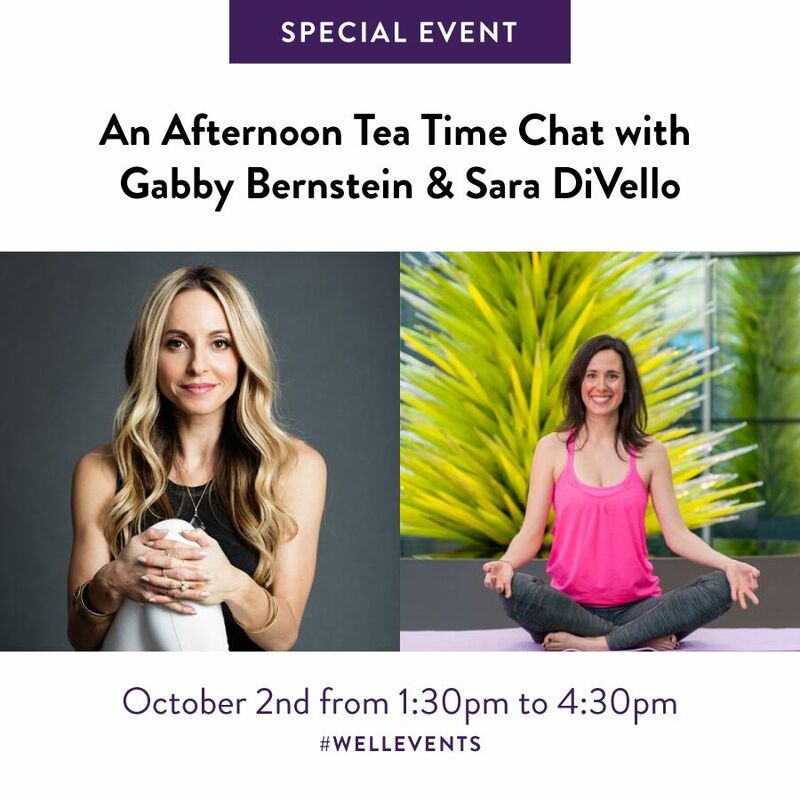 October 2, 2016 The Well Summit is bringing together two spiritual powerhouses, authors, and industry thought-leaders Gabby Bernstein and Sara DiVello for a special Tea Time chat. This exclusive two-hour event will include a Q&A session and book signing. This special event is also an opportunity to celebrate the launch of Gabby Bernstein's new book The Universe Has your Back. Gabby Bernstein is a New York Times best selling author, international spiritual speaker, and self-proclaimed, Spirit Junkie. Oprah Winfrey deemed Gabby the "Spiritual guru of this generation." Sara DiVello is an acclaimed yoga teacher and author of Where in the OM Am I? One Woman's Journey from the Corporate World to The Yoga Mat. It's really important for authors, well-preneurs, and women to support each other, and I'm thrilled to be leading this awesome event with Gabby. The WELL Summit is leading the conversation on all aspects of living well--and Gabby's message of tuning fear into faith is an important one--whether you're trying to live your best life, launch a business, or just be happier on a daily basis. I know this event will be illuminating and nourishing for everyone there, and I can't wait to be part of it. The WELL Summit Tea Time Chat with Gabby and me will embody everything I love about the WELL Summit: intimate, accessible, soulful, powerful. Intimate: tickets to the event will be limited to ensure that attendees get that enriched, personalized experience. Accessible: We're inviting attendees to submit their questions ahead of time so that they have time and space to think about what they want to ask--plus this way, there won't be all that pressure of getting up in front of everyone and asking your question into a mic. Soulful: Instead of a formal speech to a crowd, which can feel impersonal, we're structuring this as a more personal conversation. I'll be leading the conversation with Gabby--talking about the messages in her book, as well guiding the Q&A as Gabby answers questions from attendees. Powerful: We want this to feel like having tea with a group of friends...and one of your friends is a New York Times Bestselling author and Oprah Super Soul 100 Spiritual Guru. :) This is a chance to ask her anything and can launch people onto the next step of their journey. All attendees will leave with a gift bag of carefully curated wellness products and a copy of Gabby's new book, "The Universe Has Your Back" so that they can continue to be nourished and pampered at home. VIP guests will receive copies of Sara and Gabby's books, premier seating, front of the line privileges for Gabby's post-talk book signing, and an extra-luxe swag bag. VIP attendees will also receive a bonus: Gabby Bernstein's True Power Digital Workshop ($297 Value). In this five hour program, Gabby teaches her favorite techniques to combat our most common problems -- from anxiety and addiction to burnout and resentment. Please note: In order to receive this Workshop, the WELL Summit will need to share your email address with Gabby Bernstein.